THE MASS: ART OR SCIENCE? While I remember the Tridentine Mass as a young child and a young teenager, I don't think I ever thought of the Mass as a sort of science project but rather understood it as an art, the art of worshiping God. Somewhere, though, in the post-Vatican II euphoria about the new springtime of the Church and what was called "renewal" which referred to everything that was being deconstructed and supposedly reconstructed in and new and improved way, that imminent eschatology was finally being made manifest in the Church through Vatican II renewal and its so-called spirit. Thus, priests and nuns shedding defining clerical clothes and habits would make them seem so close to the laity that a new springtime of vocations and the ministry of priests and religious life would blossom. Has it? No!!! The renewal of Mass became scientific too. If the Mass was simple, easy to understand, in a first graders ability to comprehend the vernacular and if the signs and symbols were big and flamboyant, the prayers proclaimed with gusto, the priest warm and friendly, the congregation likewise and if creativity on the local level was prevalent, there would be the escaton before you knew it. Has that happened? NO! We now have about 20% of Catholics attending the simplified vernacular Mass with lots of lay activity and warm, caring ministers compared to the horrible days prior to the Council when about 90% of Catholics attended Mass each Sunday. The clearest sign of a mental illness is doing something over and over again thinking one will finally get a good result when the good result never comes, try as one may, over and over again to make a better result. The Tridentine Mass now known at the Extraordinary Form had one basic premise. Through it the Church gave us the form of worship that parishes and religious houses throughout the world would use to make present the one sacrificed of Christ and bring about the consecration of the Bread and Wine into the Body, Blood, Soul and Divinity of our Risen and Glorified Christ. It was an art form from the choreography, to the chanting and the various movements of the priest and ministers and the choir's overlay of chanting. Even the Low Mass was an art, not a science that capture the religious imagination of all involved and brought them to a level of contemplation of the mysteries of salvation. Liturgy is an art, not a science. We need to go back to the EF Mass and follow as conservatively as possible what Sacrosanctum Concilium asked for in terms of the "renewal of the Mass and the Sacraments." SC was not asking for a revolution, just a little bit of simplicity, a litter bit of vernacular, a little bit of inculturation, and a lot of faith, hope and love all artfully crafted. 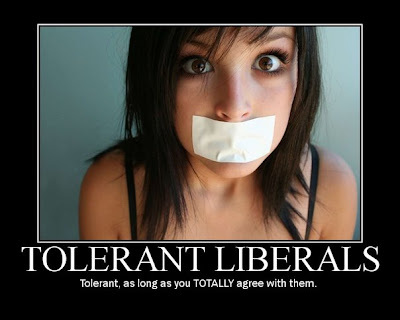 With the "intolerant Nazis" aka liberal progressives, try to keep a fast food chicken sandwich chain out of their communities because its owner believes in natural law and the definition of Marriage as it has been defined for thousands of years, we see how insidious the "world" is towards believers and they give us reason to look again at Saint John's Gospel and realize that no authentic Christian can follow the ways of the "world" as St. John defines it and as we are now experiencing from manipulating cultural engineers who are in the mass media, liberal politics and academia. People who are not Christian or religious at all take for granted that marriage is the union of a man and a woman for the sake of family and, of its nature, for life. The laws of civilizations much older than ours assume this understanding of marriage. This is also what religious leaders of almost all faiths have taught throughout the ages. Jesus affirmed this understanding of marriage when he spoke of “two becoming one flesh” (Mt. 19: 4-6). Was Jesus a bigot? Could Jesus be accepted as a Chicagoan? Would Jesus be more “enlightened” if he had the privilege of living in our society? One is welcome to believe that, of course; but it should not become the official state religion, at least not in a land that still fancies itself free. Surely there must be a way to properly respect people who are gay or lesbian without using civil law to undermine the nature of marriage. Surely we can find a way not to play off newly invented individual rights to “marriage” against constitutionally protected freedom of religious belief and religious practice. The State’s attempting to redefine marriage has become a defining moment not for marriage, which is what it is, but for our increasingly fragile “civil union” as citizens. I celebrated the 10:30 AM Sung Mass at the Church of the Most Holy Trinity this Sunday morning. I was the pastor there from June 3, 1991 until June 30, 2004. I had not celebrated a Sunday Mass there since I departed on June 30th, 2004. It was wonderful and it was great seeing so many people I haven't seen in a long time and to see all the new faces there too. Most Holy Trinity has always had a long tradition of fine choirs and liturgies. They did not disappoint this morning and we sung it all, from metrical hymns to the official Introit, Offertory and Communion antiphons. The choir director and organist at the historic Jardine Pipe Organ is Dr. Nancy Sutton. The Jardine goes back 1863 but Jardine and Company didn't want to break the north's blockade of the south and so it languished on a dock in New York, until in 1866, Most Holy Trinity's associate Pastor, the priest-poet of the south (Confederacy) Father Abram Ryan, gave poetry readings and raised the money to bring it to Augusta. It was historically and completely restored with pump action (and also electricity) in 1995. Most Holy Trinity is the perfect place for the Extraordinary Form of the Mass which has only been celebrated once since SP there. Pray that they are allowed it more frequently as there is a huge group in the metro Augusta area that would appreciate it. 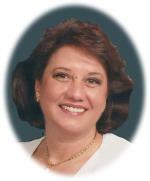 NORTH AUGUSTA, S.C. - Entered into rest Friday, July 27, 2012, Mrs. Cheti Paola Warner, 66, wife of the late Clifford E. Warner. Mrs. Warner was a native of Vicenza, Italy, but has lived in the Augusta area since 1965. She retired as a hairdresser after 50 years of making people feel beautiful. Mrs. Warner was a member of the Church of the Most Holy Trinity and was active in PCCW and worked as the hospitality coordinator for the church. Family members include son: Clifford E. Warner II (Michelle); daughter: Angela Randall; and granddaughters: Baliegh Alexis Warner, Elizabeth Cheti Warner, and the late Gabrielle Elizabeth Warner. A memorial mass will be held Monday, July 30, 2012 at 12:15 P.M. at Church of the Most Holy Trinity with Fr. Allan McDonald celebrant. Shortly after I arrived at Most Holy Trinity in 1991 she became a very active member and as indicated in the obituary she was active with the Council of Catholic Women, but her greatest gift and ministry was cooking and organizing our fabulous parish receptions for all kinds of events, including the many "First Solemn Mass" receptions for parishioners who were ordained priests for our diocese and religious orders. She was a native Italian and would also cook our special meals for big events at the rectory and always in the Italian Vincenza style and all the courses. It was fabulous, absolutely fabulous and will always be a highlight of my ministry there. She also cut my hair for the past 20 years. I'm always in Augusta every Monday for my day off and to visit my aging mother. So Cheti would always cut my hair at her salon. I just kidded her about two months ago saying that I had aged in the mirror I sat in front of as she cut my hair for the past 20 years. How is it that the mirror stayed the same and I changed so much (not really). God rest her soul! My mother tried to keep the Italian custom at Epiphany of La Befana who brings toys to children on it's eve. My father did not like the custom and did not allow it once we moved from Italy to Atlanta in 1957. "Italy's traditional celebration includes the tale of a witch known as La Befana who arrives on her broomstick during the night of January 5 and fills the stockings with toys and sweets for the good children and lumps of coal for the bad ones. 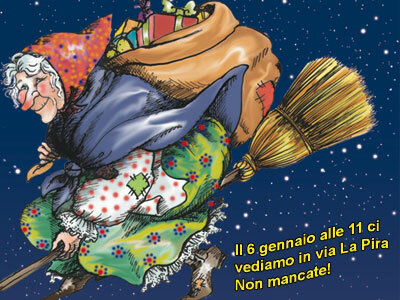 Now La Befana flies around on her broomstick each year on the 11th night, bringing gifts to children in hopes that she might find the Baby Jesus. Children hang their stockings on the evening of January 5 awaiting the visit of La Befana." Well leave it to Cheti to give me La Befana's presents each Epiphany for the past 20 years. She never gave me a lump of coal! I will miss her smile, hospitality and Italian love. 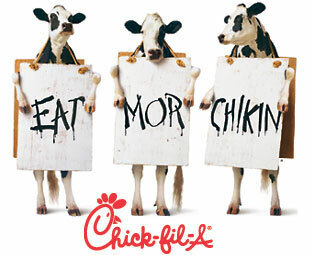 Okay, I admit it, I love Chic-fil-a and I eat there often. I had it for lunch today and usually every Monday. I especially admire the owners of it and their Christian beliefs that have led them to keep their stores closed on Sunday out of respect for the 3rd Commandment, to keep holy the Lord's Day. I wonder how much money that has lost them over the years. Founded in Atlanta, Georgia in 1946 and renamed in the 1960's, Mr. Truitt Kathy has kept his store closed on Sunday. That's admirable! And now those who oppose the Catholic Church and other Christian Churches and other religions which believe that marriage is between one man and one woman, have labeled Mr. Kathy's Christian publicly professed faith about marriage between a man and a women as "anti-gay" and "anti-marriage equality." They have labeled him and his business as bigoted. The mayors of Boston and Chicago, two ultra liberal cities who tout tolerance as the hallmark of their communities, will work hard to prevent Chic-Fil-a from entering their market. So much for tolerance. I have to say that progressives in the Church act in the same boorish way toward conservative Catholics. Well, if the world is labeling a businessman and his business as anti-gay and anti-marriage equality and thus bigoted, then you can only imagine how the Catholic Church and her adherents will be labeled now and in the future. The question that remains is how well will post-Vatican II Catholics whether this mockery of Catholicism and our core sacramental beleifs and how many will deny Christ over these conservative beliefs? Will the majority of Catholics formed by our Ordinary Form Mass stand up for the faith or deny it? I am not too confident that the majority of post-Vatican II Catholics will side with the Church. Like Peter and others, they may well deny Christ and His teachings when confronted by the cruel, intolerant world, especially Catholics in the northeast and the mid west and the northwest, but I could be wrong, but I doubt it. 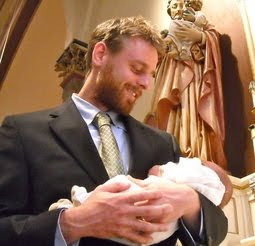 I believe that Major League Soccer All-Star Eddie Gaven who Rediscovered the beauty of Catholic Faith through the Extraordinary Form Mass will be more than equipped to be a martyr for the faith in the spiritual battle over marriage. What is your favorite aspect of Catholicism? Well, three aspects really stand out. The first one is the Rosary, which is an incredible prayer or series of prayers. It has had a deep impact on my life and has renewed the faith in my heart. It’s a very calming experience to pray the Rosary because you’ve come into Christ’s presence through the heart of Our Lady. The second one — Eucharistic adoration — is closely related to the first. You go from one type of Christ’s presence that you can experience anywhere into another type that you can only experience in a sacramental way. That is, you’ve placed yourself before the tabernacle or monstrance in the church where Our Lord resides under the appearance of bread. We usually go as a family to adoration once a week. This is in addition to attending Sunday Mass and then daily Mass as often as possible. Eucharistic adoration is an extension of the worship we give to Our Lord in the Mass. That brings me to the third aspect of Catholicism that I appreciate so much: holy Mass. No tongue can express the power of the Mass because it’s the same sacrifice as Calvary. We should see it that way and act accordingly, but, oftentimes, there’s irreverence. I grew up with the Novus Ordo Mass, unaware of the Latin Mass. However, when I started looking into the faith more seriously, I came across the Latin Mass, which was quite an experience to see for the first time. It was beyond anything I’d ever dreamed of. There’s so much reverence in the Latin Mass, which I attend regularly now. I’m very thankful to Pope Benedict for making the “extraordinary form” more widely available through his motu proprio five years ago. I enjoy sharing the Latin Mass with others and often invite teammates to attend with me. It truly is, as many have said before, the most beautiful thing outside of heaven. WHO KNEW THE PRE-VATICAN II CHURCH WAS SO EXHUBERANT, SPONTANEOUS AND THAT POPE PIUS XII WAS SO CHARISMATIC? Leave it to us Italians to make even the pre-Vatican II Church and papacy quite charismatic rivaling that of Pope John Paul II. This is a stunning film in its technicolor quality. Who knew Pope Pius XII was so charismatic! Thanks to YTC for sending it to me. We need this kind of triumphalism to lift our spirits! Honestly, I always thought Pius XII was rigid, aloof and stuffy. Obviously this is a movie, but the papal scene is Pius XII unless they had a great stand-in double. And rare footage of the charismatic Pope John Paul I and his brief reign of one month in 1978! OCCASIONALLY I GET INSECURE ABOUT MY MUCH TOUTED CLAIRVOYANCE, SO PLEASE READ THIS ARTICLE I WROTE ON MAY 26, 1988 TO PROVE TO YOU AND ME TODAY THAT I TRULY AM CLAIRVOYANT! The following is an article I wrote for the Diocese of Savannah's weekly newspaper, The Southern Cross on May 26, 1988! Keep in mind, that when I wrote this in 1988, my point on a diocesan level (I was the Diocesan Director of Liturgy at the time) was to call our parishes to recover the solemnity of the Mass that in 1988 had been lost for the most part and in many places in our diocese and elsewhere. So as you read this time warp, keep in mind what the liturgy was like in 1988! 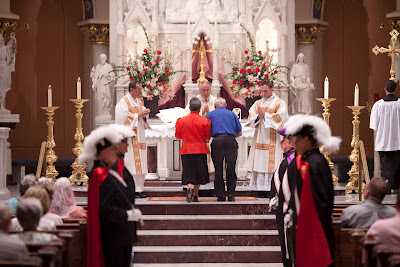 When older people nostalgically recall the Tridentine Latin Mass of yesteryear, the greatest impression that remains is the precision with which the rites were carried out. From the priest’s well-rehearsed and solemn reverence, all the way to the altar servers’ disciplined, choreographed movement in their flowing cassocks and gleaming surplices, one knew something important and awe-inspiring was taking place. The choir added its embellishing panoply to the liturgy with majestic polyphony and solemn Gregorian chant both of which evoked inspiration, contemplation, and piety. There were “bells and smells” and this was not understood in a derogatory way. After all, Catholic worship is “sensual” making use of all our senses of sight, smell, taste, touch and hearing. There were few complaints about the quality of the Liturgy in those days. No one would dare critique the sacred, because they had a deep and abiding respect for the sacred and the purpose of their participation in the Mass. Their participation in the Mass united them to Jesus Christ, the second person of the Blessed Trinity and his one sacrifice on the cross. It also united them to Holy Mother Church and her pastors. This was a big deal! But in the decades that followed the Second Vatican Council, complaints and criticism about the “renewed” liturgy soared to unprecedented volume. Many felt that what was once a fully loaded Cadillac had been stripped to a rear-engine Volkswagen. The caricatures were not without foundation. Today we hear young people, who never experienced the Tridentine Mass asking for its celebration. Is it just to be obstinate or rebellious? Or has their experience of the renewed Liturgy left them uninspired and starving for awe and reverence? Is it more a commentary on how we have carried out the renewal of the Liturgy rather than a vote against the renewed liturgy altogether? In an effort to promote the new Liturgy, many in the post-conciliar era often used the technique of denigrating the old Liturgy in order to establish in the hearts and minds of the faithful what was called the “new and improved” liturgy. Along with this trend, there was an undue emphasis placed upon the humanity of Jesus Christ to the neglect of his sovereign divinity. The “ordinary” was emphasized as the place where God could be found. And the ordinary slowly but surely crept into the life of the liturgy, architecture, art and technique. Combined with this was a pernicious mind-set which mistakenly equated “attention to detail and neatness” with a pathological scrupulosity. For the first time, priests felt it was okay to improvise during Mass, not only with fixed greetings, such a “The Lord be with you” which was changed by some to “The Lord is with you,” or worse yet, banal, secular “good morning” or “how are you,” but also to improvising with the prayers of Mass in particular the Eucharistic Prayer. The spirit of narcissism was consuming some celebrant-priests, as though their spirituality, personality and personal prayer were at the heart of the liturgy. Together with this, was the beginning of the “dark ages” of liturgical music in the vernacular that combined a banal, screeching style that ballyhooed a guitar strumming ensemble with a cadre of in-your-face vocalists. Narcissism and “it’s showtime” attitude of performance crept into those leading the assembly in the ministry of music. 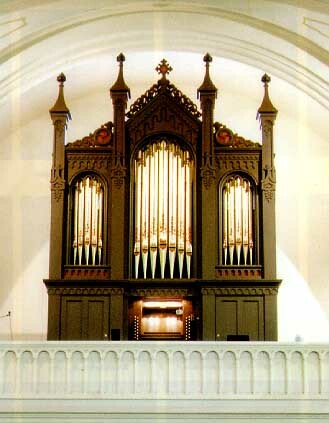 The organ was deemed outdated and overpowering. Fortunately, modern liturgical music is maturer today, but remnants of the “Glory and Praise” generation still rears its ugly head. With all the trendiness of the late 1960’s and 70’s, the church had to contend also with the charismatic movement. Guitars, drums, piano and tambourine reigned there also. “Solemn Catholic devotion” which was outwardly passive prior to the Second Vatican Council was replaced by unfettered emotion, spontaneous prayer, speaking in tongues, hands upraised and handholding. “The Sign of Peace” became a “liturgy” unto itself! The same was true with the “General Intercessions.” These became open to all, spontaneous, personal and very particular, even to the point being classified as “gossip.” Those who promoted these liturgical novelties felt it was of the “spirit of Vatican II” and the work of the Holy Spirit. Evaluation some 30 years later would indicate it was also the work of the “Assembly of God” theology and mentality that won the hearts of many Catholics of that period. Pentecostal worship by nature is less structured and more spontaneous than Catholic worship. 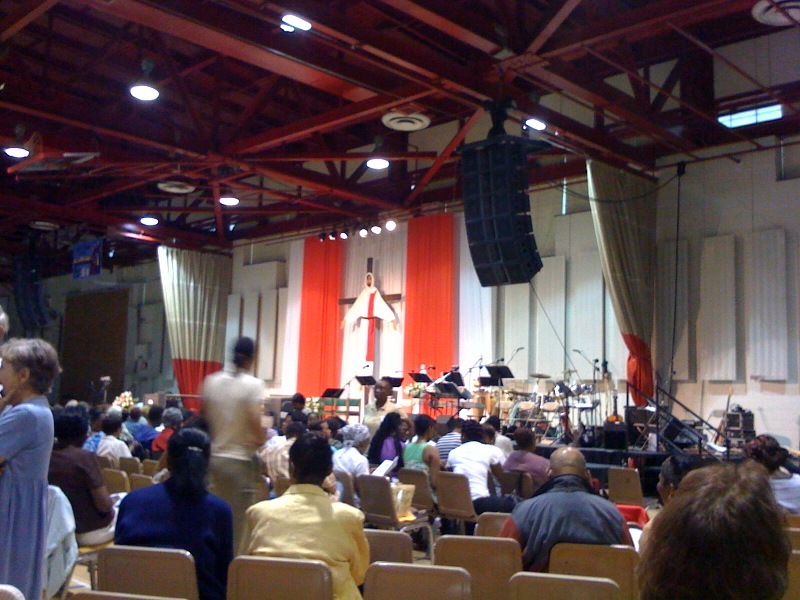 Its music is more of praise and inspiration rather than liturgical. It relies heavily on the “movement” of the spirit, emotions and feeling good because it lacks the sacramentality of the Catholic Church and our rich liturgical history, prayer and spirituality. The renewal of the Mass after the Second Vatican Council was not meant to break continuity with what had preceded it. But it was to advance the Church in her worship by maintaining a continuity between the previous style of worship through the implementation of a “noble simplicity” marked by active participation of the laity in the Church’s worship. The outward form of the Mass was in transition, but its underlying doctrines and dogmas remained in tack. New ways of showing reverence were institutionalized, but not without roots in an earlier tradition of the Church. For example, standing to receive Holy Communion as a sign of being raised up in Christ was taken from the tradition of the Eastern Church and an earlier tradition of our own. Receiving Holy Communion on the tongue or in the hand both had long standing traditions as well. Now Catholics had the option of either. Perhaps the greatest thing that the Second Vatican Council recovered, was the need for the assembly, that is, the laity, to take their rightful place in the celebration of the Mass. 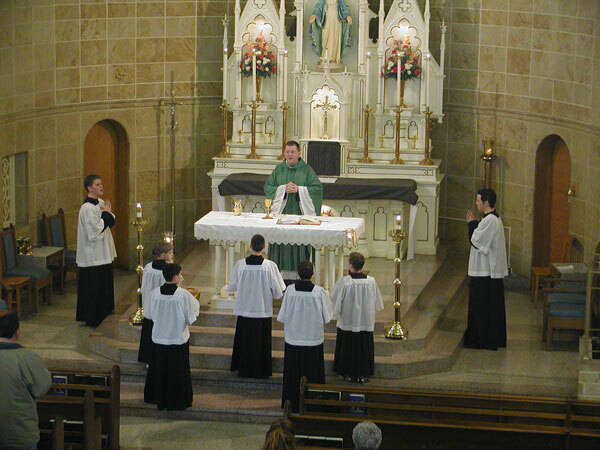 The entire assembly, not just the priest, altar boys and choir, have an important role in making beautiful, inspiring Liturgy that is pleasing to God and gives him glory and worship. 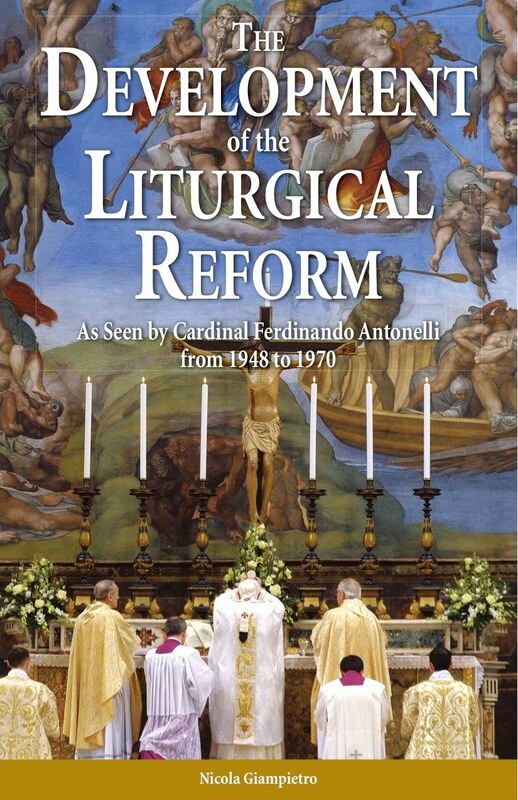 The liturgical renewal of the 1950’s had already begun this renewal within the Tridentine Mass. The Second Vatican Council simply took it many steps forward. The laity accomplish their important role by arriving at Church early, being hospitable to each other and robust in their spoken and sung responses. They are the ones who must help to create silence and stillness for active listening to prayers and scripture and the contemplation of them. Screaming, unruly, misbehaving infants and small children do not enhance the liturgy, nor does passive indifference to the singing and praying. The way the laity dress for mass may also indicate an attitude of awe and wonder or indifference for the sacred. The clergy and those who have liturgical roles such as altar servers, choir, lectors, Communion Ministers and ushers must pay close and strict attention to their outward appearance and abilities. This obviously must be inspired and motivated by an inner spirituality and reverence. The roles of each of these ministries during Mass must be choreographed to look and sound good. It must be an art form that is pleasing to the eyes and ears. Attention to the details of choreography and movements will greatly enhance the post-Vatican II Mass. We can learn important lessons from the Tridentine Mass in this regard, for this area was a major strength of the Tridentine Mass and something that should indeed be recovered! Tied into this “attention to detail” should be a concern for the environment of worship. Do our churches invite active participation, devotion and contemplation? If the priests and the laity understand the nature of liturgy, active participation and energy can be just as satisfying and edifying in a Church designed prior to the Second Vatican Council, with communion railing and high altar, as in a contemporary church building in the round. In fact the pre-Vatican II design may be more conducive since it does not exaggerate the need to see each others' faces in worship as though that is of equal or more importance than seeing God in the Sacrament. The “sacramental presence” of Jesus Christ still has a position of greatest importance in the Liturgy without denigrating the liturgical presence of Jesus Christ in the assembly, the word proclaimed and the presider! We must also use the talents of true artists and artisans to enhance the entire abode where we worship. When a beautifully crafted statue or crucifix are removed in favor of a homemade, burlap and felt banner filled with slogans and other symbols, we do a disservice to our liturgy, environment and people. Vesture for priests and servers should be beautiful and becoming. Albs for altar servers with hoods and cinctures that tie them at the waste either make them look like giant potato sacks or members of the K.K.K. Albs that are too short or too flambouant are also a distraction. Certainly all vesture from vestments to altar linens should be clean and ironed! Catholics are hungering for the sacred in their lives which are otherwise filled with the profane. The profane is neither needed nor desirable in the celebration of the Church’s liturgy. Someone once said that when we begin to rediscover and prefer the sacred to the profane, our liturgies will be such that if the Parousia were to occur during Mass, we wouldn’t know it! Concomitant with this rediscovery of the sacred is a deep reverence and appreciation for the divine presence of God. This indeed is encountered in those who assemble for Mass, in God’s Word and in the sacred signs and symbols of all the sacraments. Particularly, in the sacred species of Holy Communion, bread and wine consecrated and shared which are the body, blood, soul and divinity of Jesus Christ and his one sacrifice renewed for us, do we share God’s divine and redeeming presence. When people long for the pre-Vatican II liturgy, is it really that liturgy they long for, or is it a liturgy that is sacred, awe-inspiring and dignified? The post-Vatican II liturgy can satisfy the hungry heart just as well, if the attention to detail is present and an appreciation for the sacred is paramount. Liturgy celebrated well will “foster and nourish faith; poor celebrations may weaken and destroy it.” Let our liturgical celebrations be the best they can be and in continuity with the best of our liturgical tradition gained from the pre-Vatican II days! I have to confess that I like the Ordinary Form Mass when celebrated with EF sensibilities. I first started experiementing with making the Ordinary Form Mass more like the Extraordinary Form Mass in the early 2000's when Dr. Janet Hunt, FAGO became the Church of the Most Holy Trinity's Music Director and Organist. We did a couple of "concert Masses" around 2000 (can't now remember which ones) which we celebrated as a Mass but at a special time on Sunday (I believe it was 4:00 PM). The Church was packed. I celebrated the Liturgy of the Eucharist Ad Orientem. The Mass except for the choir parts was in English as at that time I had no comfort level in celebrating the Mass in Latin. I had many people tell me after these Masses that they loved the return of the Old Mass. They actually thought it was the Tridentine Mass. It was far from it. Later, I got the nerve with the encouragement of Dr.Hunt to start a monthly Sunday anticipated Mass at our Saturday Vigil. This Mass was led by our men's schola and totally in Latin, except for the Liturgy of the Word. The official solemn form of the Intriot was chanted as processional as were the Offertory and Communion antiphons. It was an OF Mass entirely facing the people. I didn't want to tempt fate and have our bishop crack down on me for being too retro. Celebrating the Ordinary Form entirely in Latin and all in Gregorian chant was considered even in 2002 as so pre-Vatican II by a significant number of clergy in our diocese and a goodly number of laity. Our Vigil Latin Mass was always fuller than our English Vigil. However, a goodly number of older regulars despised the Latin and would go on Sunday when we had the monthly Latin Mass, but a goodly number of Catholics from all over metro Augusta came to the Latin Mass. It told me that there were many out there longing for a better form of the Mass and in fact would love the Tridentine Mass if only it was allowed. Even since the 1980's I knew there was just something that wasn't kosher about the Ordinary Form Mass. I always thought that the template for actually implementing Sacrosanctum Concilium was the Tridentine Mass and that somehow someone hijacked what the Second Vatican Council actually desired in SC. Who would have thought that Cardinal Ratzinger who eventually would become pope would be thinking the same thing. When he allowed the restoration of the Extraordinary Form of the Mass he knew that people would see what was missing in the Ordinary Form and would want to bring what was missing back to the Ordinary form Mass. Those who think that the discipline of Vatican II is immutable and above question and change will not like what I am about to write. We need to recover the distinct nature of the cultic role of the Catholic priest as a divine call from God through the bishop from the Church in the miniature, the lay Catholic family. There has been a blurring of the roles of the laity and clergy over the last 50 years and the hyperbolic expression of that is the LCWR thinking they can act as the bishops in promoting their form of skewed reform in the Church as though they are equal to the bishops in that regard. This is spirit of Vatican II hogwash. 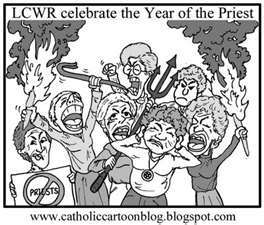 But there are many aging clergy and laity and some not so old who think like the LCWR. They are on the wrong side of history. So, how do we remain faithful to SC in its call for inculturation, some vernacular, more scriptures, noble simplicity and eliminating "useless repetition." --At sung Masses, a congregational hymn can be sung to accompany the procession to the foot of the altar. --The Prayers at the Foot of the Altar need to be recovered. The "useless" repetition of the double confiteors could be eliminated and the congregation is included in responding to all the prayers, not just the altar servers. --At the parish's principle Mass, the Prayers at the Foot of the Altar may be substituted by the tradition Extraordinary Form's Rite of Sprinkling Holy Water. --After the Prayers at the Foot of the Altar or the Rite of Sprinkling, what should be seen as the Penitential Prelude or Preludal Rite of Purification the Introit is chanted, either solemn or simple tone in the vernacular or Latin. --The private prayers of the priest are restored as he approaches the altar to kiss it and incense it, if used. The priest privately prayers the Psalm accompanying the incensation. The priest is then incensed. 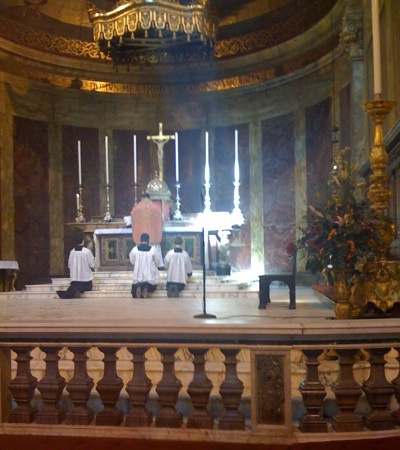 --The Kyrie, Gloria and Collect is prayed at the altar, ad orientem for Low Masses but at the Chair for Sung Masses. --The Liturgy of the Word is revised but celebrated as is customary for the Ordinary Form.The option of the Gradual or the Responsorial Psalm is a local decision. Lay lectors are the ordinary ministers for the reading, except for the Gospel which belongs to the deacon or in his absence the priest. The role of the deacon is as in the Ordinary Form no matter which form of the Mass, sung or spoken. A. We beseech you O God to protect, unify and guard your Holy Church, we pray to the Lord. B. We beseech you O God, to guide world leaders in the ways of peace and respect for all people including the innocent unborn, we pray..
C. We beseech you O God to heal all who are sick or dying and all in need, we pray..
--The offertory procession is retained. The Offertory prayers of the Extraordinary Form are restored. The offertory antiphon --is spoken in the Low Mass and chanted in the sung Mass and any other motet according to local custom. --Eucharistic Prayer I is the only canon for the sung Mass allowed, the others can be used in Low Masses only, and in the sung Mass the Roman Canon is spoken aloud but in a soft voice or it may be chanted. The Extraordinary Form rubrics for the Roman Canon are recovered. A. The "Lord I am not worthy" returns to its triplet form as in the Agnus Dei with the strike of the breast for everyone each time except for the celebrant. B. Holy Communion is kneeling at the altar railing with intinction as the norm if Holy Communion is given under both forms according to local custom. C. The official Communion antiphon is chanted with additional psalm verses and the laity are encouraged to join in the antiphon as in the Responsorial Psalm. Other hymns or motets can be sung to cover the action of receiving Holy Communion. All singing so come to a conclusion after Holy Communion for a period of silent contemplation and thanksgiving. A. The priest if at the chair prays the Prayer after Holy Communion and offers any announcements. B. 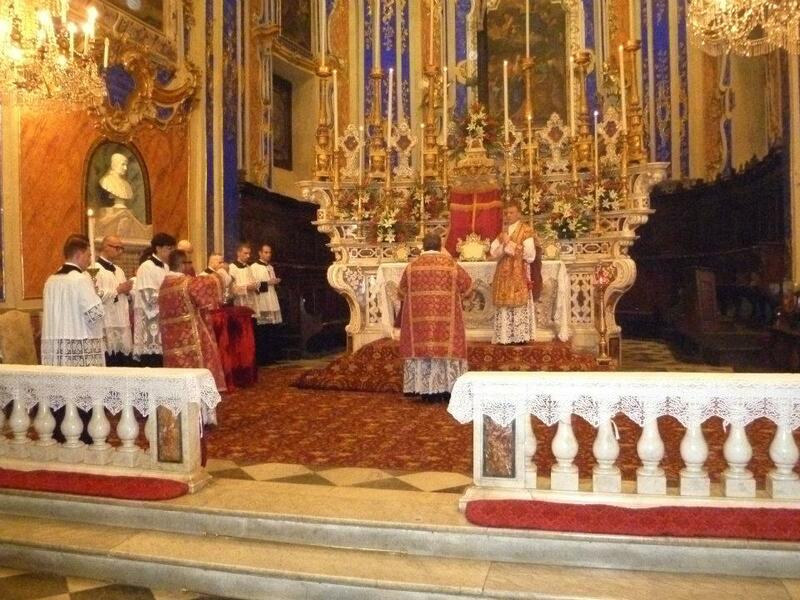 Then he processes to the altar ad orientem, bows and prays the "Placeat tibi, sancta Trinitas", he kisses the altar, turns to the laity and blesses them and then the priest or deacon dismisses according to the current options in the OF Mass. --The recessional begins accompanied by singing according to local custom. RECEIVING HOLY COMMUNION AT A DINING TABLE OR A "WALK-UP WINDOW?" While this is of course a Baroque Church, its altar and altar railing comprise a unity and the altar railing is a lovely table set for those who receive the Bread of Life, Our Lord Jesus Christ, and in this lovely Church, it isn't a walk-up window type of fast food receiving, but rather fine dining at a table set with a lovely tablecloth! From the time I was 14 until I was 19 years old, I worked at an old fashioned Diary Queen Brazier. It did not have indoor dinning. You ordered at a window and you picked up your order at a window. Compare that "fast food" approach to going to a nice restaurant like Applebees. After you order, you await the meal to be brought to you by servants, I mean, waiters or waitresses. Jesus is the ultimate Servant at the Last Supper and on Good Friday, He gives us Himself and sacrifices Himself for our salvation. As a servant (waiter)He washes the feet of the apostles, the first priests ordained on Holy Thursday during the Last Supper. Our current Ordinary Form of receiving Holy Communion is more like the Dairy Queen Brazier than the fine dining at Applebees. We now go to a "Communion Station" as though to a fast food window and we receive as though we are being dispensed the meal or medicine and we move to the next station, the Chalice station. The same thing happens. Fortunately this never took wings but was experimented with, there was a suggestion in the 1970's that the Sacred Species be placed on pedestals so that communicants could "feed themselves" rather than being fed as though they were small children. The pedestal idea was seen as "more adult!" Receiving Holy Communion from the altar railing and kneeling (or standing) allows for the priest and any delegates to come to the Communicant with our Lord, thus symbolizing Jesus initiative to come to us, to meet us and nourish and sustain us. At the railing, one waits for the priest to arrive to the communicant and then the communicant can pause briefly after receiving. Nothing is rushed and there isn't perpetual motion. It isn't a fast food experience of going up to a window to "get Jesus" but allowing Jesus in fine dining style to come to us as the Crucified, Risen and Glorious Servant of His people thus setting an example for all. TWO REVIEWS OF THE ORDINARY FORM OF THE MASS WORTH READING, HEEDING AND SEEING AS THE BLUEPRINT FOR THE REFORM OF THE REFORM OF THE ORDINARY FORM OF THE MASS WHICH WILL CERTAINLY HAPPEN IN THE FUTURE ACCORDING TO THIS CLAIRVOYANT PRIEST, WITHOUT A DOUBT! 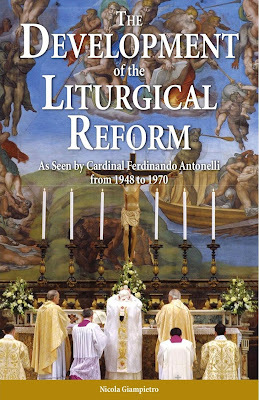 The first is a "Book Worth Reading: Cardinal Antonelli on the Liturgical Reform at the New Theological Movement, which you can read by pressing this sentence. "While Cardinal Antonelli certainly held that a more expansive reform was needed and desirable after the reform of Holy Week in 1955 (which he was in large part responsible for), and while he claimed that Sacrosanctum Concilium ultimately was “a success”, his gripe was with the Consilium (the committe entrusted with implemting the reforms of Sacrosanctum Concilium). In Antonelli’s analysis, what began as true, organic, and necessary development quickly turned into decline once this committee was formed. His notes provide a clear understanding of the actual process by which we have the newly revised Rites, Breviary, and Calendar. While expert periti worked on the various commissions studying particular questions, non-expert members who sat on the Consilium voted on their proposals. Further, the Consilium was responsible for drawing up new texts. He ultimately concludes that the Consilium had basically turned into a “continuation of the Council” and notes that many of its members were both theologically incapable as well as progressive in their outlook. In some instances he alludes to their tendencies to “de-sacralize” the Liturgy. Connected to all of this is the larger problem of theological decay in which we can place the Liturgical turbulence that ensued after the Second Vatican Council." Then Cardinal Malcolm Ranjith gave a speech expanding on the need for the reform of the reform of the ordinary form of the Mass which you can read by pressing this sentence. Cardinal Ratzinger discounted this view as untrue, for “Vatican II surely did not want ‘to change’ the faith but to represent it in a more effective way” (ibid). He affirmed that in fact “the Council did not take the turn that John XXIII had expected”. He further stated “It must also be admitted that, in respect to the whole Church, the prayer of Pope John that the Council signify a new leap forward for the Church, to renewed life and unity, has not — at least not yet — been granted” (ibid. p. 42). These are hard words indeed, yet I would say, very true, for that spirit of exaggerated theological freedom indeed hijacked, so to say, the very Council itself away from its declared goals. The Consilium, too, in implementing the Council’s Constitution on the Liturgy, was not exempt from being influenced by this overwhelming tidal wave of a so-called desire for “change” and “openness”. Possibly some of the above-mentioned relativizing tendencies influenced the liturgy too, undermining the centrality, the sacredness, sense of mystery as well as the value of what the continuous action of the Holy Spirit in the bi-millennial history of the Church had helped ecclesial liturgical life to grow into. An exaggerated sense of antiquarianism, anthropologism, confusion of roles between the ordained and the non-ordained, a limitless provision of space for experimentation — and, indeed, the tendency to look down upon some aspects of the development of the liturgy in the second millennium — were increasingly visible among certain liturgical schools. Liturgists had also tended to pick and choose sections of Sacrosanctum Concilium that seemed to be more accommodating to change or novelty while ignoring others. Besides, there was a great sense of hurry to effect and legalize changes. Much space tended to be provided for a rather horizontalist way of looking at the liturgy. Norms of the Council that tended to restrict such creativity or were favorable to “the traditional way” seemed to be ignored. Worse still, some practices which Sacrosanctum Concilium had never even contemplated were allowed into the liturgy, like Mass “versus populum” (facing the people), Holy Communion on the hand, altogether giving up on the Latin and Gregorian chant in favor of vernacular and songs and hymns without much space for God, and extending beyond any reasonable limits the faculty to concelebrate at Holy Mass. There was also the gross misinterpretation of the principle of “active participation” (actuosa participatio). All of that had its effect on the work of the Consilium. Those who guided the process of change both within the Consilium, and later in the Sacred Congregation of Rites, were certainly being influenced by all these novel tendencies. Not everything they introduced was negative. Much of the work done was praiseworthy. But much room was also left for experimentation and arbitrary interpretation. These “freedoms” were exploited to their fullest extent by some liturgical “experts”, leading to much confusion. Cardinal Ratzinger explains how “one shudders at the lackluster face of the post-conciliar liturgy as it has become, or one is bored with its banality and its lack of artistic standards....” (The Feast of Faith, Ignatius Press, San Francisco 1986, p. 100)." Very few people could have foreseen the wholesale revision of the liturgy which would come in the wake of the Second Vatican Council and certainly few could foresee that the unifiying experience of a Latin liturgy would become entirely alien to most Catholics born in the last third of the twentieth century. The unchangeable nature of this characteristic of the Liturgy was a view largely shared by Blessed John Henry Newman, Mgr Robert Hugh Benson, Mgr Ronald Knox and, until the liturgical reform happened, also by Archbishop Fulton Sheen. Commentators such as Fr Joseph Gelineau SJ, composer of the famous psalm tones, went as far as to say “the Roman Rite, as we knew it, has been destroyed”! The factors which fed into the liturgical reform after the Council were complex and in some ways, not entirely contemporary. I think we must admit that until relatively recently there has been very little scholarship that is able to accurately identify the sources of the liturgical reform. In some cases, the scholarly opinions upon which some decisions were based does not stand the test of time. We must hope that scholarly commentary which unravels some of the mystery surrounding the making of the new liturgy becomes more readily available in the near future." "The Church’s teaching authority cannot be frozen in the year 1962 – this must be quite clear to the Society. But some of those who put themselves forward as great defenders of the Council also need to be reminded that Vatican II embraces the entire doctrinal history of the Church. Anyone who wishes to be obedient to the Council has to accept the faith professed over the centuries, and cannot sever the roots from which the tree draws its life." The greatest mortal sin, moral breach, act of disobedience the SSPX have exhibited which has brought about their chastisement by the popes and the Congregation for the Doctrine of the Faith is not so much what they desire to do in worship and belief, but that Archbishop Marcel Lefebrev ordained three bishops in direct disobedience to the explicit promise of obedience that he made to the pope at the Archbishop's ordination as a bishop. This single act of defiance has brought to the SSPX the scrutiny that they have experienced which has alluded the left in terms of their "far out, and man, I mean far out" beliefs and liturgies offered in so many Catholic parishes today, by women religious affiliated with the LCWR and other "far out and man, I mean, far out" groups in the Church today. But let us take stock of things. Apart from the fact that the SSPX love the Tridentine liturgy and sacramental system, the ecclesiology of that Mass and sacramental system and the morals of the Church since the beginning, there isn't that much that separates them from the Holy Father, save, their act of disobedience to him and their rejection of the "discipline" of Vatican II. They may despise the "new" Mass and its sacramental system, its ecclesiology, its religious liberty. But the symbolism of their "divisiveness" is celebrating the 1962 missal when it should be that their founder ordained bishops in direct defiance of Pope John Paul II's direct orders that this not take place. If the most liberal bishop in the world ordained bishops in direct disobedience to the orders of the pope not to do so, that bishop and that diocese or organization would experience the same type of scrutiny that the SSPX experience and the same types of demands to adhere to Vatican II and the great patrimony of Faith of which Vatican II is but a small part. Of course since the Second Vatican Council, liturgical theologians especially in the 1970's thought that the Church should recover the earliest expressions of the Mass as described in this video. That meant forgoing the subsequent organic development that occurred over the centuries and negating that development as things that were accidents of history or of such a cultural nature for the times in which these occurred that they were to be considered as outdated. Yet, they would not apply that "outdatedness" to the primitive ways in which the Holy Mass were first experienced in its infancy. Those who prefer the Extraordinary Form of the Mass with all its organic and maintained cultural developments over the centuries have every right to appreciate and have this form of the Mass. Those who prefer the revised order of Mass since Vatican II have every right to have it as it is meant to be celebrated according to the books. They have every right to noble simplicity, some vernacular, a revised lectionary and approved liturgical ministries for the laity. Those who prefer the rites of the Eastern Rites of the Catholic Church have every right to have those rites too with all their cultural accretions over the centuries. 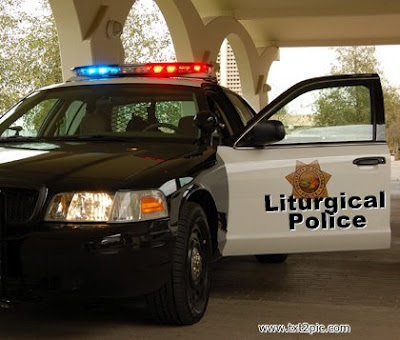 Where clergy and laity go wrong is trying to convince those who have a valid affinity to valid rites of the Church in whatever form, that their affinity is wrong, outdated and not to be allowed to them--that their affinities have been abrogated. Worst yet is the clericalism of priests who could provide the fullness of the two Masses on the one Roman Rite, but becasue of their prejudice they will not. For example if an FXSSP parish were established that only had the EF Mass and all of the sacraments in the EF, and there was not an Ordinary Form Mass offered within 50 miles, it would be wrong for that FXSSP priest not to provide the Ordinary Form of the Mass for a stable group desiring it. The same is true of the priest who has an Ordinary Form Mass parish and there is no parish that offers the EF Mass regularly, at least during the week. It would be the height of clerical arrogance for any priest to be so opposed to that which is allowed that he would refuse that which is allowed and denigrate it in the process. This is a two way street of criticism I offer those of the clergy or laity who denigrate either form of the one Latin Rite or any of the eastern rites in union with Rome. It is the height of arrogance. I've come across this time warp of Ordinary Form Masses, one the first from 1960 highlighting the Dominican Monastic tradition and liturgy of that time. One is a movie, but I think the producers filmed a Catholic Mass as it was celebrated in 1944. It is fascinating. It is a Solemn High Mass and has the chanted Confiteor prior the the laity's Communion with the additional absolution. This is removed in the 1962 missal. Then there is a Carmelite experience and finally a Protestant Episcopal Mass for Easter Sunday, which is another take on the Tridentine Mass which is a part of their heritage too. Sad they lost their Holy Orders along the way, although some Episcopal priests have gone to great lengths to be ordained by a validly ordained bishop in the eyes of the Catholic Church, not anyone in full communion, but who is considered to have valid orders which Anglican orders don't have completely, but I think we can say that God supplies what is lacking if intention and dogma is present, I could be wrong, though, but somehow I think God is pleased with this Episcopal Mass. IF UNITED METHODISTS CAN DO IT, YOU'D THINK UNITED CATHOLICS COULD TOO! 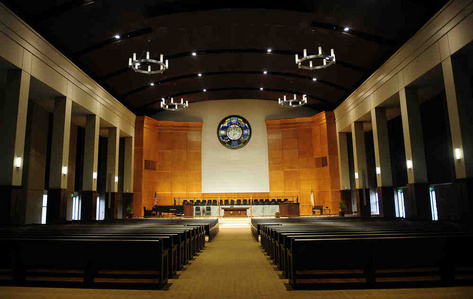 For the most part, Methodist Churches in the North Georgia District tend to build churches that look more like Southern Baptist Churches rather than high Episcopal. Usually the choir is dead center, with a large pulpit, dead center on the "stage" and then on the nave level, directly below the pulpit and up against the stage is a Protestant "Communion Table" with a plain brass cross and two brass candlesticks. Wesley United Methodist Church seems to have been influenced by the liturgical renewal of the Second Vatican Council which did indeed influence many Protestants, in particular the Protestant Episcopal Church in this country. After Vatican II the redesign of the Book of Common Prayer relied heavily upon Catholic liturgical principles in the post Vatican II renewal period. I do not know what this particular Methodist Church's worship looks like. Typically Methodists only have "Holy Communion" once a month, normally the first Sunday. Their liturgy in their hymnal has a format similar to the Catholic Church, but in the south is seldom followed word by word or order by order. It is normally more Baptist looking in expression and ministers may or may not wear robes. Liturgical vestments are extremely rare except for the altar servers who do wear cassock and surplice, oddly enough and the choir members typically wear choir robes. But I draw your attention to the video above and the photos. I believe this is quite a beautiful building both interior and exterior and could easily be adapted for Catholic use. It looks very Catholic doesn't it? It's central altar, more rectangular than box like and small, would work well as a Catholic altar, either facing the people or ad orentem. Add a nice size crucifix to the back wall, some nice statues or icons and it would be stunning. Of course add a choir loft at the back of the Church would be easy to do. 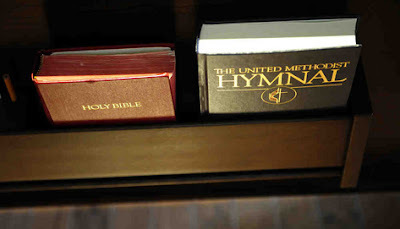 But notice too that the United Methodist have a national hymnal. I don't think the Methodist Church allows for competition in having a variety of hymnals. What in the name of God is the Vatican thinking in not mandating that the various language groups have a national hymnal with what should be known by every Catholic in the world in terms of Latin texts and what the Vatican scrupulously approves for vernacular hymns? The money making machine of capitalism we have today with different publishing houses publishing different throw away hymnals and hard back hymnals with composers making money composing new music for new hymnals every few years is a scandal to the nth degree in the Catholic Church. We can learn a great deal from our Protestant brothers and sisters in putting an end to this silliness! The reason why Protestants have robust congregational singing is because they have a national hymnal and they learn what is in it and sing it regularly and don't change it or add new music to it. IT DOES NOT TAKE A ROCKET SCIENTIST OR A LITURGIST TO FIGURE THIS OUT FOLKS!!!! IF CATHOLICS CAN'T SING, BLAME THE VARIOUS PUBLISHING HOUSES FOR CATHOLIC MUSIC AND BISHOPS WHO HAVE FAILED IN MANDATING A NATIONAL CATHOLIC HYMNAL IN THE VERNACULAR (ALTHOUGH I FEAR WHAT WOULD BE IN IT IF THERE A CERTAIN CONSERVATIVE MUSIC ORGANIZATION IN THIS COUNTRY DOESN'T DECIDE WHAT SHOULD BE IN IT AND IF CATHOLIC OREGON PRESS GETS ITS WAY!) In the video, you will note very briefly that this new Methodist Church has quite a lovely altar railing! Yes, and altar railing. Typically Methodists, when they have Holy Communion once a month, kneel for Holy Communion. 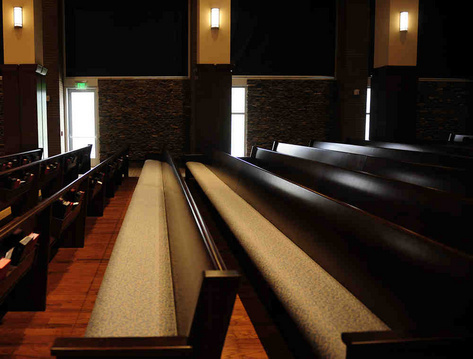 They don't normally have kneelers on their padded pews but Methodists will go and kneel at the altar railing for private devotions. Why in the name of God and all that is holy are modern liturgists so phobic about kneeling and having altar railings and kneeling for Holy Communion. It is truly astounding and the lame excuse that standing was the norm in home churches and ancient basilicas is, well, just lame! If the Methodists can build this, have altar railings and a national hymnal, you'd think Roman Catholics could too! IF THE EPISCOPALIANS CAN HAVE A COMMUNION PROCESSION WITH KNEELING FOR HOLY COMMUNION ALSO, WHY IS IT THAT SOME IN THE CATHOLIC CHURCH ARE SO PHOBIC ABOUT THIS TRADITION IN THE ROMAN CATHOLIC CHURCH? What you see in the Episcopal Church is their version of the Holy Communion Procession. It is very clearly a Holy Communion Procession. But how many Holy Communion Processions do you see? One? No! There are two Holy Communion Processions. There is the procession of the Communicants to their station at the altar railing. Then there is the Holy Communion Procession of the Priest with the Consecrated Host and the two Chalice Ministers,both of whom are lay people but vested for this awesome ministry. These two processions, mimic what occurs (or at least should occur) at every Catholic Mass. First the laity dress for Mass at home, hopefully in their "Sunday Best." Then they process to the Church, greeting people as they arrive at the doors of the Church and then enter solemnly to their positions in the nave of the Church, the pews, spending quiet time in prayer in meditation, preparing themselves as though they were praying the Prayers at the Foot of the Altar. Then there is the Procession with the Priest and the ministers of the Mass to begin the Mass. Here we see that symbolically, the people are called or summoned by Christ to Church and then Christ comes to them in the Priest as the Mass begins. In the traditional method of receiving Holy Communion in the Catholic Church, which is now totally lacking in the "Normative Form" of the Mass, the same thing happens at the time of Holy Communion which is so obvious in the video above. The people process to the altar railing, which is an extension of the Altar table. 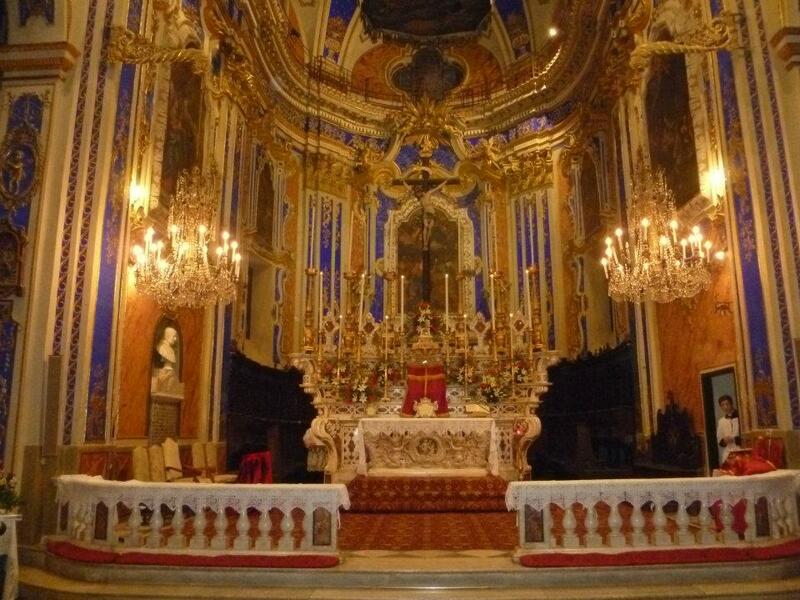 In fact in some places, the altar railing has a cloth draped over it making it look like a tablecloth. In the video above, it is very clear that the communicants are in procession to their table as they kneel at it and await the procession of our Lord to them. But what is missing in most Catholic Masses today is the procession of the priest and the Extraordinary Ministers of Holy Communion to the communicants. In the revised form of receiving Holy Communion, what is called the "normative" form, the priest, deacon and any extraordinary ministers of Holy Communion are more like pedestals, stationary like frozen statues, for the people to come, like going to a window at a fast food restaurant to pick up your meal, unlike going to a sit down restaurant and having the waiters process to you with your meal. The first is "grazing" and the second is "true dinning." What the Episcopal method of distributing Holy Communion above shows very clearly and what every Catholic Mass once showed very clearly through signs and symbols, is that salvation is a two way street, a two way procession! First by God's divine initiative, He processes to us with His Son, which is unmerited and a sign of His unconditional love for us. Salvation always begins with God throughout salvation history. Because of Original Sin and actual sin, sinners often process away from God or separate themselves from God by their actions and omissions. The very fact that anyone processes to Mass is a sign that God has summoned them there and they have responded to this grace by actually going in procession to Mass! At Mass and if in a state of grace, free of sin, either venial or mortal, they are summoned again to the Communion rail. At the rail, they await the Holy Communion procession to them, where the priest and or any extraordinary ministers of Holy Communion bring them the Sacred Species, the Body and Blood of our Crucified, Risen and Glorified Lord under these sacred signs which also have great symbolic signage in and of themselves. When the communicant arrives at the altar railing and humbly kneels as a sign of their soul's risen but subjugated status before the King of their Soul, Jesus Christ, who alone has made them "worthy" as unworthy as they are, to have Him come "under their roof" He has nonetheless said the "word" that has healed their soul! This points to the necessity of this two way street of salvation, God's procession to us and ours to Him as a result of His grace! This is quite vivid in the video above isn't it in the two wonderful processions we see in action, sacramental action!? Please note that the communicants have time to leisurely pause as they kneel and await Holy Communion coming to them in the most important procession of the Mass! They also have time to remain briefly given thanks to God for His coming to them in Holy Communion. This is totally lacking in the perpetual motion of the laity's procession to Holy Communion and back to their pews in the normative truncated procession of the Mass today in the Ordinary Form. Please note the priest who is the only one distributing the Host with two vested Chalice Bearers. These are presumably licensed chalice bearers in the Episcopal Church. Please note they too process with the chalice to each communicant thus extending their time at the table of the Lord which is by its extension the altar railing! There is constant processing by the Ministers of Holy Communion. They are not "stationary pedestals" in the least and certainly not frozen statues making everyone come to them without a reciprocal procession! There is great symbolism in this in terms of salvation, isn't there, totally lacking in the "normative" way of distributing Holy Communion since the 1970's in the Catholic Church! Finally, in the name of God and all that is Holy, why is it that the Episcopal Liturgy above is more in continuity with the Extraordinary Form of the Latin Rite Mass than the actual "Normative" form of the Latin Rite Mass today as celebrated in most Catholic Churches. 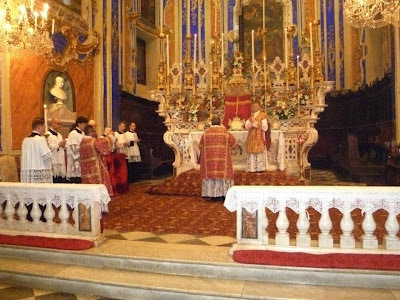 How is it that the reform of the Latin Rite Mass that Sacrosanctum Concilium envisioned, a minor reform, came to be such a rupture in sign and theology, which an Episcopal Liturgy is a better sign of the very same reform? This is the scandal that must be rectified by the "reform of the reform of the Ordinary Form of the normative Latin Rite Mass!" Compare the video above with its two solemn processions to the video below which is more than likely normative in most Catholic Churches today. How sad, how far we missed the mark in the revision of the Tridentine Mass! 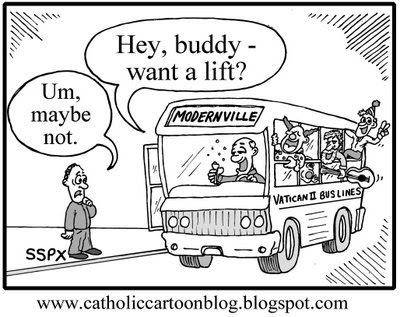 This so sad and so far from what the Mass was intended to be in the Post-Vatican II era! And in praise of the "grain of wheat" one-way communion procession to pedestal like communion ministers, so typical today in so many Catholic Churches, so sad! As an aside, look where the tabernacle is placed and the centrality of the large green fern like plant placed centrally below the crucifix where the tabernacle must have been at one time, that speaks volumes too. But listen closely to the hymn at this one way communion procession and its words, it sounds idolatrous combined with what is happening here! The Ordinary Form of the Mass which some call the "normative form" of the Mass is a revision of the Tridentine Mass. Like it or not, the guidelines used for the revision of the Tridentine Mass stem from the Second Vatican Council's Sacrosanctum Concilium. It indicated that the rites of the Mass should be intelligible, encourage active participation and acquire noble simplicity. Useless repetition should be avoided. (Of course I'm paraphrasing all this). The new Mass was first developed in Latin and given to the Church around Advent of 1969. The Roman Missal had minor revisions in the 70's and also around the mid 1980's. It's General Instruction was revised in 2002 and slightly again in 2011. The Latin version was revised in 2002/03. The Latin Revised edition was revised in English in 2011. The greatest problem with the revised Mass stemmed not so much from its Latin version as it did from its extremely poor English translation in 1969. It used a flaw translation technique that relied entirely too much on giving us an equivalent translation of the Latin rather than a more literal translation. I've watched Italian movies that have English caption and I can't believe what I'm reading in English compared to what I'm hearing in Italian, the English equivalency distorts the actual words of Italian in a horrible way, although preserving some essence of what is said but not really. That is the problem with the older English translation, it is a terrible distortion of the meaning of the Latin with its devotional qualities. That has been rectified in the new English translation, thus preserving our Latin tradition in English. This is new for us English speakers! So, with the new, improved and literally correct English translation of the Latin Ordinary Form Mass, how do the priest and congregation celebrate it as envisioned? First we have to accept that the Ordinary Form has more options because it is allowed in English and people will know what is happening based upon understanding the language. This does not mean the priest has to tell you what option he is using and certainly there should be no improvisation of the English except where it is explicitly allowed. Usually this is allowed somewhat at the introduction of the Penitential Act, the intro to the Universal prayer with its conclusion and that's about it. The art of celebrating the Mass hinges first on the priest who should not treat the prayers of the Mass as a proclamation to the people. It is the priest giving voice to the congregation of their prayers to God, through Jesus Christ and by the power of the Holy Spirit. The mannerism and voice inflection of the priest should indicate that he is praying to God, not directing his prayers to the congregation. This is more easily done "ad orientem" which is not forbidden in the Ordinary Form but when facing the people, the priest should not create eye-contact with the congregation, perhaps should angle himself toward the altar and when celebrating the Liturgy of the Eucharist toward the congregation, a crucifix should be central on the altar for the priest to look at rather than looking at the congregation. The Sung Mass on Sunday should be the norm and the priest's parts, all of them, should be chanted by the priest either in simple or solemn chant depending on the skills of the priest or the solemnity of the Sunday or Feast day. The chants for the congregation should be in keeping with the normative music of the Mass in the Latin Rite which is Gregorian chant or chant like music. The organ or no accompaniment should be the norm. Other instruments should be limited. 1. Instruments associated with secular music should not be allowed, such as instrumentation for folk songs, rock and roll, heavy metal, bar music, and the like. Usually this would mean, guitar, snare drums, bongo drums, tambourines, castanets, cymbals, piano and electronic sounds and synthesizers. Simply eliminating these sorts of instruments would greatly aid the reform of the Ordinary Form of the Mass and make it what it was intended to sound like. 2. The style of singing needs to be evaluated and certain styles eliminated. Contemporary styles are fads, that is what contemporary means, it changes with time and today rather quickly. Gregorian chant and its derivatives should be admitted and simple enough, nobly simply that enables the congregation to sing and chant too. I think the Vatican should mandate universal hymnals in the vernacular with what is expected to be sung and what chants should be used in the vernacular with an index for "hymns of a Catholic nature" peculiar to each country or nationality. 3. The placement of the choir needs to be revisited. The choir loft is the best location as this prevents the choir from distracting the congregation or acting as though they are performers on a stage. If the choir is not in the loft, it should be in an elevated area in the back of the Church or well off to the side of the congregation. Choirs confrontation to the assemble should be avoided at all costs. 4. All ministries of the Mass should be well rehearsed. Vesture for official lay ministry should be prescribed, whether Suit and tie for men or formal dress for women. The causal attire of formal ministries as well as the casual attire of those who attend Mass should be challenged. I believe that if these guidelines were followed which in no way revises what is already in the rubrics and General Instruction, but simply puts these options into place, we would have a much improved Ordinary Form Mass across the board while maintaining legitimate options built into the Ordinary Form Mass. None of this means that there should not be a revision of the Order of the Mass of the Ordinary Form and its rubrics and General Instruction to make it more like the Mass from which it came. But that is up to the Pope alone and whom he designates to do it. I hope some future pope will do so and make the Ordinary Form of the Mass more like the Extraordinary Form so that there is not a rupture in the way we worship as Catholics in either form and that it is clear that the Ordinary Form is a slight revision of the Extraordinary Form according to the broad and general description of that reform in Sacrosanctum Concilium which was and is a very conservative document. I'm not advocating that it will be easy to recapture a Catholic culture in this country that will be seen by Catholics as above the culture they live in, where they are more influenced by their Church rather than the media and popular fads and trends and where having a child within a sacramental marriage is viewed as a gift from God to be embraced and where the process of pro-creating is viewed with awe and wonder and great fear of being a co-creator with God of a new human life. Human life and conception are viewed as gifts to be properly experienced and not as diseases or maladies to be medicated, manipulated or truncated. With that said, we must also say that the Tridentine Mass had an appeal to boys and men that inspired them to consider a priestly vocation. 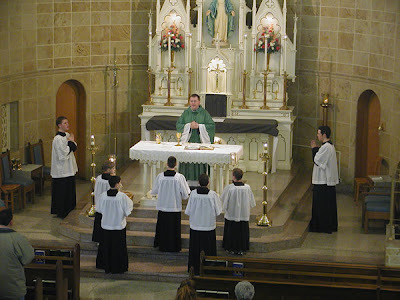 What is it about the Tridentine Mass now known also as the Extraordinary Form of the Mass that attracts young boys and men to consider a priestly vocation and in great numbers? 1. The ethos of the EF Mass is more masculine in "personality" compared to the Ordinary Form. By that I mean it is more regimented,military like, "solider like" "march like" and in sinc with masculine attitudes for better or worse. Men are more private about their faith, less flamboyant and not normally given to wanting to be the center of attention. They are more cut and dry, prefer precise directions and less prone to the openness of how females conduct themselves. Whereas females are more intuitive, more fluid in their approach to order and more spontaneous. Women are more touchy feely than most men. They are more emotional and center their relations on feelings. The OF seems to embrace the sensibilities of the feminine more so than the EF. 2. 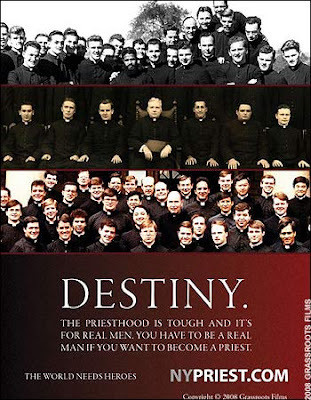 The cult of altar boys as a recruitment for the seminary and priesthood has been lost as well as forming a community of altar boys based upon prayer and carrying out the rites of the Mass and other liturgies with great precision and pride. For the most part this has been lost in most parishes and altar servers are not well trained, have minor roles during the liturgy and don't take what they do as seriously as is demanded by the right implementation the celebration of the Mass. If we believe that the priesthood is key for the celebration of the Mass and that there will be no change in the discipline of who gets ordained, then we need to recover that which promoted and inspired young boys and men to consider the priesthood. I continue to be amazed at how reticent so many are to implement SP and start celebrating the Extraordinary Form of the Mass for those who request it in their parishes. I think it is the age old story of just not being able to keep up with the times and being too closely aligned to a particular theology or period of time. It is very difficult for people ordained in the 1980's and prior to believe that everything they were taught about Vatican II and Liturgy can be in any way questioned and that a return to more ancient practices is quite possible once again. Of course they were schooled in the hermeneutic of rupture and bought into it "hook, line and sinker" and just cannot fathom that everything old is new again. I've said this before, but many seem to make ecclesiology, sacramental theology, and pneumatology into such a wide contrast between the EF Mass and the OF Mass as to prove the Holy Father's position that there was a rupture in the Church as a result of Vatican II but not necessarily from the documents themselves but how these documents were written that allowed for a rupture theology subsequent to the Council that has been rampant almost since day one of the close of the Council. But the bottom line, if there is an improved "ecclesiology, sacramental theology, and pneumatology" received from the Council and developed over the course of the past 50 years, what fruit has it developed? Well, for a smaller and some say less "pure" Church it is good for those who have stayed or is it? Surveys today tell an abysmal story about Catholic belief and practice amongst rank and file clergy and laity when compared to their counterpart prior to the Council. The greatest strength of the Pre-Vatican II Church has to be viewed from the perspective of what percentage of Catholics actually attended Mass each Sunday and that was close to 90% of all Catholics. Today it is a miserable 20 to 30 % depending on the part of the country. That is failure no matter how you cut it. On top of that those Catholics who attend have a very fiercely independent type of faith that is not necessarily Catholic, it is make-it-up as you go. It is not based upon humble acceptance of the Faith and Morals of the Church as well as Canon Law. It is based upon wishful thinking. This is a miserable failure of the post Conciliar Church too. No matter how you cut it, the Church has been in crisis mode since about 1968 if not a couple of years earlier and the one consistent reason for it is how Vatican II was interpreted and implemented by Pope Paul VI, the Bishops in union with him and the rank and file theologians of the day and finally parish priests and congregations as well has those in religious orders. It has been a disaster. Like an alcoholic who has to hit rock bottom before overcoming his/her denial of their disease in order to do something about it, there is a significant group of Catholics who would be classified as "post-Vatican II modern Catholics and proudly so" who are in gross denial and need to recognize that denial and become part of the "Reform of the Reform within continuity with the pre-Vatican II Church." This has ramifications for not only the Liturgies of the Church and specifically the Mass, but also for ecclesiology, sacramental theology, and pneumatology. We can no longer accept the post-Vatican II perspective on any of these as the status quo that can't be changed and reformed and within continuity with the pre-Vatican II Church. The Church's future may be predicted more by the SSPX than the LWCR. I report, you decide! There are two extremes in the Church which are mirror images of each other. The first group which has been called to accountability for decades now by the Vatican is the SSPX. Their sin is that they want to be more Catholic than the pope and reject most of Vatican II and evidently do not see Vatican II as a part of the "teaching" magisterium of the Church. In rejecting Vatican II they perceive they are preserving historic Catholicism. You can read Fr. Z's take on the SSPX latest communique by PRESSING HERE. Then we have the Leadership Conference of Catholic Women (LCWR) who really want to reform the Catholic Church to be more Episcopalian than the Episcopal Church. 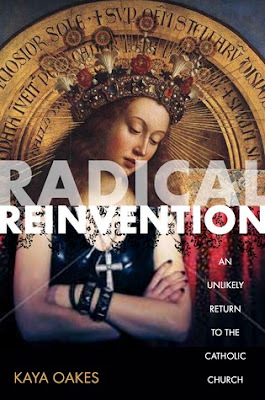 They want to "re-imagine" the Church according to a deconstructionist model that rips away its historic roots in morality, doctrine, dogma, liturgy, and canon law. Yes, they want to be more Episcopal than the Episcopalians and have the temerity to believe they can reform the Church from within. You can read Catholic World Report on "Sister Pat Farrell, president of the LCWR, deflects, blames, and otherwise obfuscates" BY PRESSING HERE! To be honest with you, SSPX has more to offer the Church in terms of future reforms than the LCWR. I think the handwriting is on the wall or in the blogs. "It's beauty is beyond discussion, at least to reasonable people" and that is the problem, reasonable people for those who hate this are really unreasonable! My parents married in 1945 and I was born in 1953 as the youngest of three. So we were a pre-Vatican II family until 1965 when we became a post-Vatican II family, so I am an eye-witness to this grand historic shift in the Church, but my parents would have had a more nuanced understanding of it at the time. My father was an early to bed and early to rise sort of person. He was a simple person too. He liked the early Sunday morning Low Mass because, well, it was short and of noble simplicity. So that is the Mass we attended until the Sunday anticipated Mass was possible in the late '60's and then that was the Mass of choice on Saturday night. But we did go to the Tridentine's High Mass for Easter and Christmas and maybe a few times during the year, but not frequently. I never attended a Solemn High Mass with deacon or subdeacon until I actually celebrated it a couple of years ago as a Requiem. 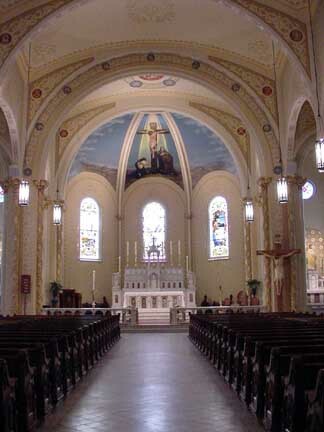 When I was ordained a deacon in November of 1979 in Baltimore at St. Mary's Seminary, the next day (Sunday) I took my family to the Cathedral of Mary our Queen around the corner from the seminary for their sung Mass. I happen to love that Cathedral, which the Episcopalians would call, the Cathedral of Mary "Their" Queen. It was as high as an Ordinary Form Mass could be in a very high Cathedral. I don't remember who the priest was but he gave a stunning homily which impressed me at the time, though I couldn't tell you now what he said. But afterward my family, including my sister and father said that it was "too high-faluting for them." By that they meant the grandeur of the Cathedral itself, but also the pomp of this humble Ordinary Form Sung Mass. Keep in mind our parishes in Augusta are simple church buildings and by that time in the late 1970's the noble simplicity of the Mass meant barely any singing of the Mass itself and certainly no incense, pomp and circumstance, that was all pre-Vatican II stuff. But even the EF Mass can be celebrated simply certainly as a low Mass and even as a Sung "High" Mass. It is the Pontifical High Mass that has all the pomp and circumstance that can be off putting for some, especially with all the brocade and lace that seems to bring out homophobia of progressives to no end. But most parishes seldom if ever had a Pontifical High Mass or even a Solemn High Mass. Their Masses when sung or spoken were by the book although I do think that many priests but not all would speed read the Mass and be rather sloppy in their reading of it, but since the Mass was mostly quiet and with the priest facing the liturgical east, it wasn't as noticeable as it is in the OF Mass if that take place. And in the OF Mass, if one adds a lot of pomp and circumstance, it is based on what the priest of liturgy committee wants, not what is necessarily prescribed, since so little is prescribed in the rubrics or GIRM for choreography and ceremony of the OF Mass. So in the OF Mass the cult of the personality either of the priest or the parish is foisted upon the congregation by the creativity employed to "dress" things up. Not so in the EF! You have strict rubrics and instructions for each form of the EF Mass from the Low Mass, to the Sung Mass, to the Solemn Sung Mass to the Pontifical Sung Mass. It is not left to the creativity or idiosyncrasies of the liturgy committee or the priest as to how any of these will look. It written in the ceremony and in great minute detail. The National Catholic Reporter has a snarky blog on the Pontifical High Mass that has Cardinal Burke making comments on the EF's beauty and the need to recover this beauty. YOU CAN READ IT BY PRESSING HERE, BUT NOTICE THE COMMENTS THAT FOLLOW! "The pomp, the color, the splendor, the lavishness, the gold -- especially the impossibly gold vestments, the gold candlesticks, the gold statues -- is just overwhelming. This, Burke explains, is the sort of worship Jesus wants. The video is titled "The Call of Beauty." I wonder what the reaction of thoughtful Catholics might be." But nothing in the NCR's brief blog nor the video shows anything but a Pontifical High Mass celebrated by the books. But to describe this setting and this style of the EF Mass the typical Mass in the typical parish shows how prejudicial the blogger is and how prejudicial those who only want the OF Mass and a very stripped down version of it or a very puffed up version based upon the celebrant's idiosyncrasies want today. It is sad to say the least. RELIGIOUS FREEDOM CAMPAIGN: IT'S ONLY JUST BEGUN! THE GLORY OF GREGORIAN CHANT--NOT! Love of God or Love of Mass?